Gujrat city was constructed in the form of a fort and it had four gates to enter in the city of Gujrat. It was called main Gujrat and now a days it is in the center of Gujrat. These doors/ gates of Gujrat were kept closed in night and in the time of any enemy attack. Above mentioned all four gates are still present, but in very miserable condition. 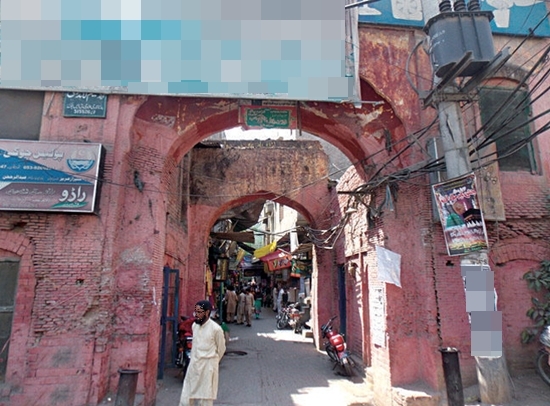 Government of Pakistan and Archeological Department of Punjab Government should take some serious steps to preserve these historical gates in their original shape and design. It is also said that there were also four small gates of Gujrat. Gujrat fort was constructed by Mughal Emperor Jalal ul Din Muhammad Akbar in 1596~97. It is the symbol of Mughal Architecture in Gujrat. It is present in the center of Gujrat City. It was built on a heap to make it prominent and secure. It was a type of deep well which had stairs to go down. Emperor Akbar constructed it near the main building of Gujrat Fort. But with the passage of time it was ruined. It is still present in its demolished state. Royal Hakeems (Doctors) of Akbar suggested the treatment of a disease of Akbar’s wife in a special type of Bath Room. So this special type of Bath Room was built in Gujrat near Gujrat Fort for the Treatment of Akbar’s Wife. Many people still takes bath in this Akbari Hammam to get rid of their many diseases. There are many other notable ancient buildings in Gujrat City and other towns and villages of Gujrat District. If you know any of them or you have any photos of these ancient building or places, please send us on web_nazam@live.com and we will publish it in this website blog. we had our ancestral home in sheeshiyan wala gate in gujrat, pakistan. can anybody from pak please add some pictures here from that historical place, i really long to have a look at the place where my ancestrals dwelled. I am surprised that no pictures are given of these buildings. What a beautiful city and I proud on it my ancestors are belong from this city.